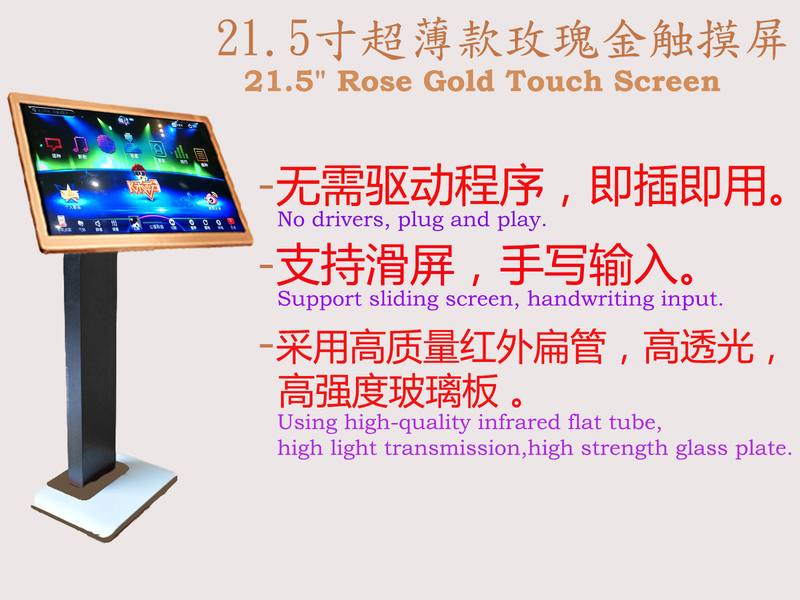 All in One Karaoke System With TouchScreen Panel. The Karaoke System including songs in multiple languages, such as Chinese, English, Malay, and so on. Using embedded development technology, specifically for small K field, bars, clubs and other business venues environment development, 24 hours trouble-free operation. Perfect default configuration items, the largest streamlined configuration operation. Cloud and U disk add song, the background plus song three easy way to add songs, easy to maintain music library, the largest reduction in unnecessary cost inputs, improve efficiency. New background software, and cloud server intelligent networking, automatic access to the latest system resources on the network, real-time comparison software version, to ensure timely upgrades. System allow us to use IOS and Android mobile phone install the apps let us more easy for control the karaoke system and enjoying.~ The Karaoke System including songs in multiple languages, such as Chinese, English, Malay, and so on. System allow us to use IOS and Android mobile phone install the apps let us more easy for control the karaoke system and enjoying. +6016-6680228. To inquire more about our products, Thank you.